Mountain Aid held another successful Mountain Safety day at the Albert Hall Stirling on Saturday 11th October 2014. Opened by patron Cameron McNeish the event was well attended, with plenty to interest hill goers. 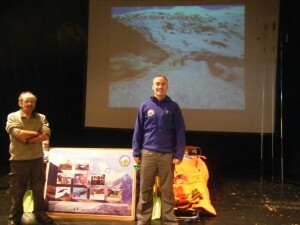 Clothing and equipment displays from the main outdoor equipment suppliers, plus displays on mountain skills and safety advice from numerous providers. ST John Scotland provided a display showing the support they give to all rescue teams in Scotland. Forth Valley rescue teams were centre stage giving advice on mountain safety, what to do in a mountain incident, and the equipment they have. Killin MRT provided an avalanche display showing avalanche sites in Central Scotland, how to avoid getting caught in an avalanche and how to use avalanche transceivers.